Against Euthanasia research papers explore anti-mercy killing options for terminally ill patients. One of the most frequently voiced arguments against euthanasia is a sort of “slippery-slope” argument. If today we kill terminally ill patients who want to die, will we tomorrow kill terminally ill patients who do not yet wish to die, but who are using precious medical resources in a time when society is struggling to pay for medical care? And if we come to the point where we decide it is necessarily to kill all the terminally ill, will we then begin killing others who we do not thing are making a significant contribution to society, such as the severely disabled? The morals of euthanasia come into debate. Although such arguments might at first glance seem absurd, one only has too look back as far as Hitler’s Germany to see that such policies are indeed within the scope of human decision making. This is a topic suggestion on Against Euthanasia from Paper Masters. Use this topic or order a custom research paper, written exactly how you need it to be. Euthanasia is the term used to describe assisted suicide. It is most commonly associated with the actions of the healthcare industry, nurses and physicians, who choose to end the suffering of patients diagnosed with painful, incurable conditions. Euthanasia is a controversial legal, medical ethic, and moral issue. 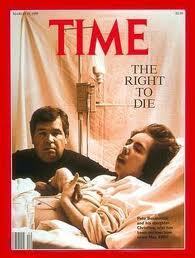 Advocates of euthanasia consider it a justifiable act of mercy when conducted with the patient's consent. However, opponents of euthanasia condemn it as a form of murder. Euthanasia is distinct from withholding potentially life-saving treatments, a practice that is considered legal when ordered by a patient. Many states, such as Oregon, permit physician-assisted suicide while still condemning euthanasia as a form of homicide. J. Gay-Williams notes that one practical argument against assisted suicide, or any form of with euthanasia for that matter, is that no one can predict what medical science will discover in the future. It is not inconceivable that a person suffering from a painful, debilitating and terminal illness would have the right to die only months before an effective treatment were discovered. Finally, there is the possibility that euthanasia could be used in thoroughly immoral, if not criminal ways. It would be possible, for example, for an heir to decide that his father, no longer able to communicate his wishes to his doctors, would elect do end his father’s life well before he knew his father actually would have considered his life no longer worth living. Ethical and Legal Implications of Euthanasia- Ethical and Legal Implications of Euthanasia Term Paper looks at a preview of an order placed whether to permit the assistance of suicide. Paper Masters writes custom research papers on Against Euthanasia and explore anti-mercy killing options for terminally ill patients.